The Exaltation of the Cross celebrated on September 14 is one of the twelve great feasts in the yearly Church cycle. It commemorates two historical events: first, the finding of the Life-giving Cross in the year 326, and second, its recovery from Persia in 628. In the first centuries of Christianity, during the years of persecution, the pagans wished to destroy all evidence of the life of Jesus Christ, and the Cross on which He was crucified disappeared. With the conversion of Emperor Constantine the Great, Christians were at liberty to worship openly and build churches. The emperor’s mother, St. Helen, longed to find the True Cross of Christ. She traveled to Jerusalem and was told by a very old Jew that the Cross was buried beneath the temple of the pagan goddess Venus, built in 119 AD by the Roman Emperor Hadrian. The temple was torn down, and digging in the earth below uncovered three wooden crosses. The small board which had hung over Christ with the inscription "Jesus King of the Jews," had long since fallen off, and there was no way of telling which was the True Cross and which were the crosses of the two thieves crucified on either side of Christ. A sick woman was brought and likewise a dead man who was being carried to burial. The three crosses were laid in turn one by one upon the sick woman and upon the dead man. Two of the crosses had no effect, but through contact with the third cross, the sick woman was healed of her infirmity and the dead man came to life. These miracles clearly indicated which of the three was Christ’s Cross. To house the relic of the True Cross, St. Helen had s church built over the Holy Sepulchre. The church was consecrated on Sept. 13, 335, an event also commemorated in the service hymns of the Feast. The finding and exaltation of the Cross was appointed to be celebrated annually on the following day. The Life-giving Cross was kept in Jerusalem until the year 614 when the Holy City fell to the Persians who looted the Church of the Resurrection and took the True Cross back with them to Persia. Fourteen years later Emperor Heraclius concluded a peace with the Persians, and the Holy Cross was brought to the imperial capital of Constantinople. The Emperor, taking off his shoes and his imperial robes, carried the Cross into the Church of Holy Wisdom (Agia Sophia) where it was once again triumphantly exalted. It was then resolved that the Feast be celebrated by the Church in all parts of the world, for which reason it is called the Universal Exaltation. The Vigil for the Feast, one of the most moving and impressive services of the year, contains several distinguishing features. After Vespers the Cross, decorated with flowers and sweet-smelling herbs, is placed upon the altar. Following the Gospel reading in Matins, the faithful sing “Having beheld the Resurrection of Christ…” usually sung only during Saturday night vigils. At the end of the Great Doxology, to the slow singing of the Trisagion –”Holy God, Holy Mighty, Holy Immortal, have mercy on us”– the priest, carrying the Cross on his head, brings it out from the altar and places it on an analogion in the center of the church. 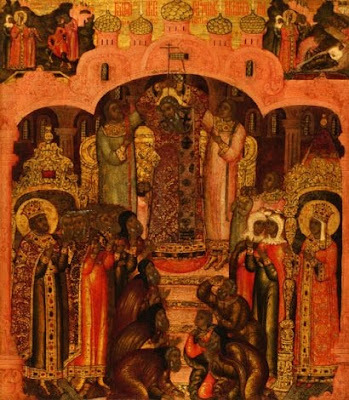 He censes the Cross on all four sides, and everyone prostrates before it to the singing of the hymn: “Before Thy Cross, we bow down, O Master, and Thy holy Resurrection we glorify.” Then the faithful, following the celebrants, venerate the Cross in turn, making three full prostrations, and receive anointing. The Cross remains in the center of the church until the Apodosis or “leave-taking” of the Feast on September 21. In cathedrals and monasteries the adoration is preceded by the ceremony of exalting the Cross. After the Cross is brought out from the altar, the bishop or archimandrite takes it up in his hands and raises it on high. Then, as the people chant “Lord have mercy” a hundred times, he slowly lowers the Cross nearly to the ground and just as slowly raises it. This is done five times as the celebrant faces first east, then west, south, north and east again, signifying that “the Cross is the guardian of the whole world” and through it “the world is sanctified.” In some churches the Cross has rose water poured over it during these exaltations. The rose water is caught in a basin of flowers held by the acolytes, and the flowers are distributed to the faithful at the end of the service. Although it is one of the major Church Feasts, the Exaltation is always kept as a fast day, because together with the joy of the finding of the Cross, this great “weapon of peace and sign of victory,” we are also reminded of the sufferings which our Lord endured in being crucified. When properly applied, the sign of the Cross is a most formidable weapon in a Christian’s armor. The power of the Cross in the unseen warfare with the demons is illustrated in countless lives of Saints. One of the most strtking examples is found in the life of the holy martyrs, Sts. Cyprian and Justina (Oct. 2). An expert sorcerer before his conversion, St. Cyprian was asked by a pagan youth to use his magic in order to seduce the Christian maid Justina. But even with the help of the prince of demons, the sorcerer was powerless before the maiden who “fled to the defense of the Cross of the Lord and placed its honorable sign on her forehead,” causing the demons to depart in shame. This brought Cyprian to his senses, and he railed at the evil one whom he had served for so long: “O destroyer and deceiver of all…. Now I have discovered your infirmity. For if you fear even the shadow of the Cross and tremble at the name of Christ, then what will you do when Christ Himself comes to you?” Furious at Cyprian’s rebuke, the devil began to beat and strangle him. Already scarcely alive, Cyprian “remembered the sign of the Cross, by the power of which Justina had opposed all the demons’ power, and he cried out: "O God of Justina, help me!" Then, raising his hand, he made the sign of the Cross, and the devil immediately leaped away from him like an arrow shot from a bow. The power of the Cross is given to each and every Christian. But just as a soldier must learn to properly wield his weapons in battle, so a warrior of Christ must learn how correctly to make the sign of the Cross. A shield has no effect if carelessly waved about in the air. Likewise, there are many who receive no benefit from the sign of the Cross because they make it mechanically or haphazardly. Some time ago we were justly taken to task by one of our readers for an all too common inaccuracy in describing the making of the sign of the Cross: “We touch the forehead, the breast…” Our reader pointed out that the first edition of the widely used Orthodox catechism, Archpriest Seraphim Slobodskoy’s Law of God, contained the same error which was corrected in the second edition with the following explanation: in making the sign of the Cross from forehead to breast and then shoulder to shoulder, “the lower end of the Cross turns out to be shorter than the upper one; i.e., the Cross comes out upside-down.” Man thereby inverts the Cross of Christ “to which only the demons rejoice.” The Holy Fathers taught that the sign of the Cross should be made by touching first the brow (the forehead), marking the upper part of the cross, secondly the womb (the stomach), marking the lower part of the cross, thirdly the right frame (shoulder) and fourthly the left frame, representing from end to end the horizontal bar of the cross. "But God forbid that I should glory save in the Cross of our Lord Jesus Christ."